Don't tell anyone we said so, but needlepoint instructions are not rocket science, and most people will learn how to needlepoint competently in far less time than it takes to read War and Peace (and we don't mean the Russian version, either).Good needlepoint instructions will tell you to use good quality needlepoint canvas and good quality yarns and fibers. If you do this you will get a great result even on your first try. Take a piece of advice from the French - it's all about the ingredients, ma cherie! 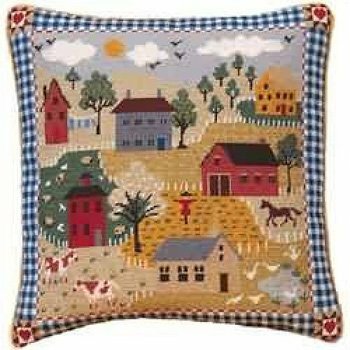 Needlepoint Instructions - What Is Needlepoint? The American Needlepoint Guild defines needlepoint as - "any counted or free stitchery worked by hand with a threaded needle on a readily countable ground." What? Let us explain. 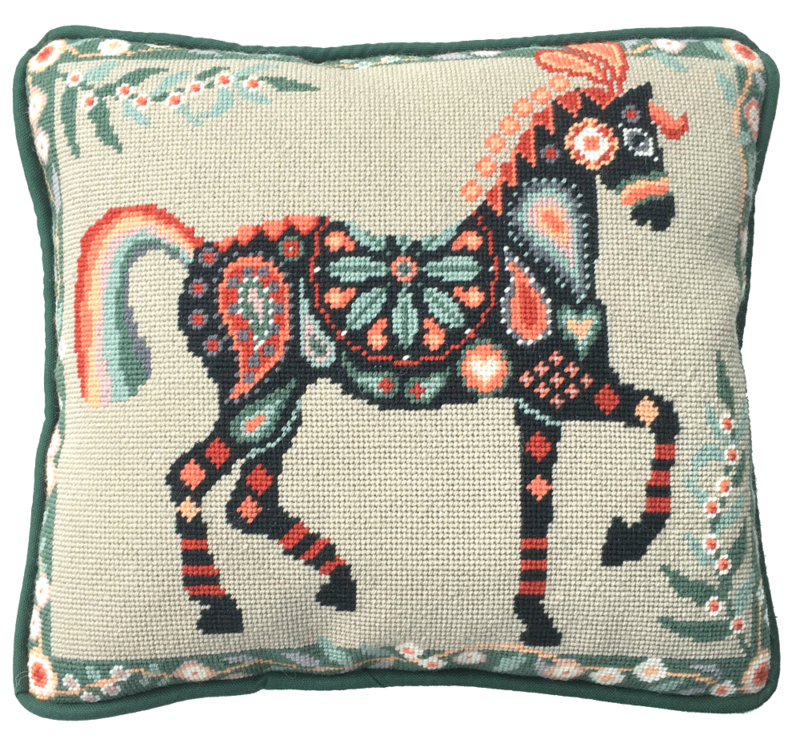 Needlepoint is the art of pulling a needle, threaded with yarn, through a canvas mesh, in order to create gorgeous, one-of-a-kind, vibrant, stunning designs that can be finished as pillows, pictures, belts, bags, almost anything. That's better! Good needlepoint instructions always explain things simply. The threads used to needlepoint can be wool, cotton, silk, metallic, or almost any other type of fiber. The canvas used in needlepoint is selected from a variety of mesh sizes and styles. This site focuses on the basics and we will refer you to other stitch sources if you want to get more complicated. In fact, you may never need to. All you really need to know you will find right here. You could spend your whole life perfecting a few basic needlepoint stitches, and experimenting with the myriad of fibers, designs and finishing styles there are out there and never, never get bored. Trust us! Needlepoint Instructions - How To Get Started. You may want to begin by working with a needlepoint kit. We love kits. A lot of the decisions have been made for you. The designer/manufacturer has chosen the canvas, selected the right size needle, sourced the yarns and provided just the right amount of all these elements to ensure a perfect needlepoint creation. A good needlepoint kit will also include good needlepoint instructions for "how to" complete the design. For this reason, kits are a great way to start. 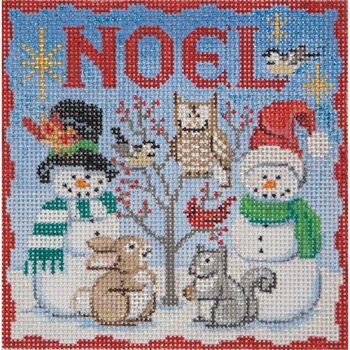 See our extensive range of needlepoint kits from all over the globe. What you will not get from a needlepoint kit is complete customization. Maybe you have an itch to stitch (sorry, sometimes we can't help ourselves) a needlepoint footstool with frogs. Well you are probably not likely to find a frog needlepoint footstool kit. However, there are certainly frogs sitting on handpainted needlepoint canvas lily pads out there just waiting to be stitched and finished as footstools. 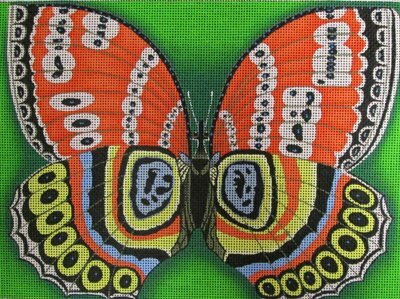 If you want flexibility and customization then you are looking for needlepoint canvas with or without the design already printed or painted on to it. Click here to go to blank needlepoint canvas. Or, for the real deal you are looking at a hand painted needlepoint canvas. These are expensive items, but worth it if needlepoint is your passion or you love the design. So, you have your canvas and you have an overview of needlepoint instructions. Now you need to know how to stitch. Have fun, and contact us with questions about needlepoint instructions. We are always glad to hear from you. Contact us about these needlepoint instructions.